Right in the middle of Minnesota, on one of the 10,000 lakes, an old man lived in his little house. He was very proud of it, and never tired of admiring the whiteness of fresh snow in the winter, and the pretty birch trees, which in warm weather always sprouted leaves, so that the smell of the trees and flowers would come into his little house. One day he was standing looking at the lake opposite, when he heard a kind of rumbling noise in the room behind him. He turned round, and in the corner he beheld a rusty old iron kettle, which could not have seen the light of day for many years. How the kettle got there the old man did not know, but he took it up and looked it over carefully, and when he found that it was quite whole he cleaned the dust off it and carried it into his kitchen. Then he took the other kettle off the fire, filled the new one with water, and put it in its place. No sooner was the water in the kettle getting warm than a strange thing happened, and the man, who was standing by, thought he must be dreaming. First the handle of the kettle gradually changed its shape and became a head, and the spout grew into a tail, while out of the body sprang four paws, and in a few minutes the man found himself watching, not a kettle, but a squirrel! The creature jumped off the fire, and bounded about the room like a kitten, running up the walls and over the ceiling, till the old man was in an agony lest his pretty room should be ruined. He cried to a neighbour for help, and between them they managed to catch the squirrel and shut him up safely in a wooden chest. Then, quite exhausted, they sat down on chairs, and consulted together what they should do with this troublesome animal. At length they decided to sell him, and bade a child who was passing send them a certain tradesman called Jackmand. When Jackmand arrived, the old man told him that he had something which he wished to get rid of, and lifted the lid of the wooden chest, where he had shut up the squirrel. But, to his surprise, no squirrel was there, nothing but the kettle he had found in the corner. It was certainly very odd, but the man remembered what had taken place on the fire, and did not want to keep the kettle any more, so after a little bargaining about the price, Jackmand went away carrying the kettle with him. Now Jackmand had not gone very far before he felt that the kettle was getting heavier and heavier, and by the time he reached home he was so tired that he was thankful to put it down in the corner of his room, and then forgot all about it. In the middle of the night, however, he was awakened by a loud noise in the corner where the kettle stood, and raised himself up in bed to see what it was. But nothing was there except the kettle, which seemed quiet enough. He thought that he must have been dreaming, and fell asleep again, only to be roused a second time by the same disturbance. He jumped up and went to the corner, and by the light of the lamp that he always kept burning he saw that the kettle had become a squirrel, which was running round after his tail. After he grew weary of that, he ran on the balcony, where he turned several somersaults, from pure gladness of heart. 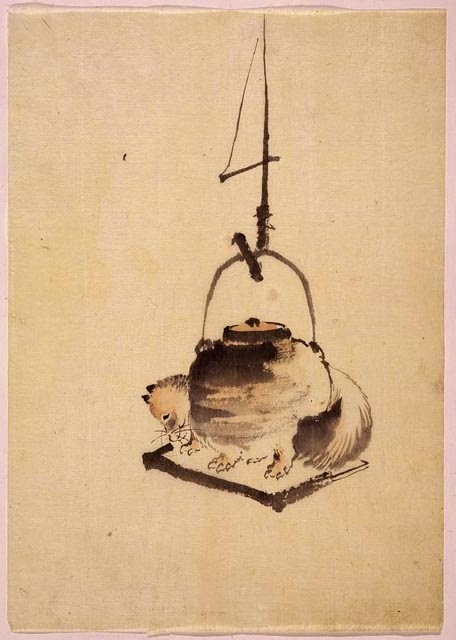 The tradesman was much troubled as to what to do with the animal, and it was only towards morning that he managed to get any sleep; but when he opened his eyes again there was no tanuki, only the old kettle he had left there the night before. Jackmand thanked his friend for his counsel, which he followed exactly. The squirrels's consent was obtained, a booth was built, and a notice was hung up outside it inviting the people to come and witness the most wonderful transformation that ever was seen. They came in crowds, and the kettle was passed from hand to hand, and they were allowed to examine it all over, and even to look inside. Then Jackmand took it back, and setting it on the platform, commanded it to become a squirrel. In an instant the handle began to change into a head, and the spout into a tail, while the four paws appeared at the sides. 'Dance!' said Jackmand, and the squirrel did some steps, and moved first on one side and then on the other, till the people could not stand still any longer, and began to dance too, and it seemed as if all would go on dancing forever. And so very likely the squirrel would, if Jackmand had not declared he had danced enough, and that the booth must now be closed. The man thanked Jackmand, and said that few people would have been as honest as he. And the kettle brought them both luck, and everything went well with them till they died, which they did when they were very old, respected by everyone. They made a movie about that woman?